If you hear your dog's paws clicking like they have on tap shoes…. it’s time for a trim! You can usually here it when they walk across a hard surface, like hardwood flooring. Most dogs detest having their feet handled, however, if you, so clipping their nails at an early stage, they will get used to it. Always reward your dog with a treat after the trimming session. A dog’s toenail is made up of the nail itself and the quick. The quick is the pink part of your dog’s toenails that provides the blood supply to the nail. Try to avoid cutting into the quick because it bleeds quite a bit and it’s quite sensitive. 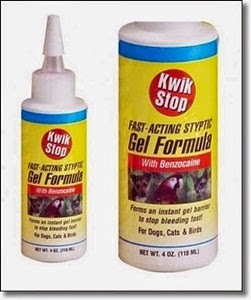 If your dog’s nails does bleed, use kwik stop to stop the bleeding. Kwik stop is a sulfer product. When packed on the bleeding nail it stops the bleeding almost immediately. Both of my dogs had black nails. I went out and purchased the nail clippers. After seeing that their nails were black,( I hadn’t noticed because hair usually covered their nails), I decided to let the professionals do it. I had them trimmed with they went for grooming. The groomer told me that I can cut their nails, and showed me under the nail there is a groove and the quick has a more fleshy look to it. She said that I should always cut about an 1/8 of an inch in front of that groove. Here is a step by step chart showing exactly how to cut dark nails. With dark nails when you trim just a bit off it will look chalky. That means you can trim a bit more. Then when you see a wetness appear and then a small dot appear stop! Usually the same length is good for all nails. Please view the videos below showing how to properly trim your dog’s nails.